Pakistan Probe: Could Osama Mission Geronimo Have Revealed a Secret New Helicopter? 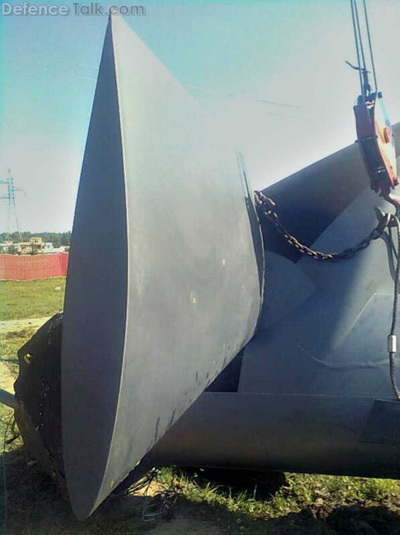 A picture of the tail rotor of the chopper that the Navy Seals' Team Six detonated revealed unfamiliar features. Reports say it could be a new, secret helicopter. This is believed to be the wreckage of a US military helicopter which took part in a Navy Seal commando operation to hunt down Osama bin Laden, the world's most wanted man. 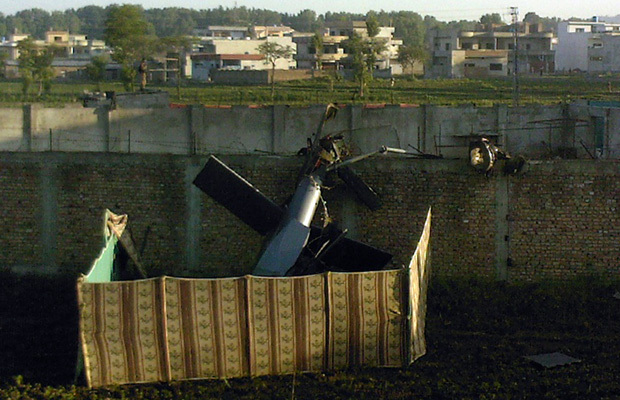 When the Team Six members reached Osama bin Laden's compound in Abbottabad one of the choppers made a "controlled but hard landing," according to reports, probably due to higher than expected temperatures. Temperatures affects the density of the air, and low density makes it harder for the rotor to sustain the weight of the chopper, especially if it was near its maximum weight (being packed with soldiers and fuel to fly in from Afghanistan). Abbottabad is about 1200 meters above the sea level, and altitude also affects air density. 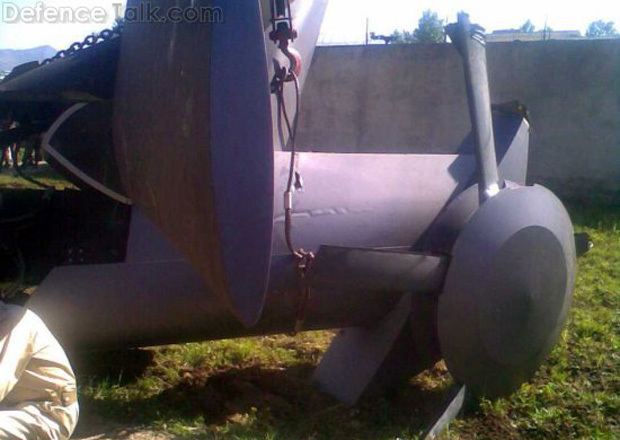 So what machine exactly experienced the hard landing described above? Short answer: we don't know for sure. Long answer: It seems that the tail rotor visible in the picture belongs to a highly modified version of the H-60, the chopper of choice of the special forces for more than 30 years. doesn't beat around the bush, claiming: "A previously undisclosed, classified stealth helicopter apparently was part of the U.S. task force that killed Osama bin Laden in Pakistan on May 1." Aviation Week then goes techie and explains what we can see from that picture: "Photos disseminated via the European PressPhoto agency and attributed to an anonymous stringer show that the helicopter’s tail features stealth-configured shapes on the boom and the tail rotor hub fairings, swept stabilizers and a 'dishpan' cover over a five-or-six-blade tail rotor. It has a silver-loaded infrared suppression finish similar to that seen on V-22s." Low radar visibility was essential, for the Pakistani air force would have either scrambled its jets if an unknown threat to its airspace (and near the country's best military academy!) was detected, or fired its surface to air missiles. It's possibly more proof of the fact that Pakistan really knew nothing about the mission - or at least its first wave of attack - until it ended. The aircraft crash-landed after developing technical problems, according to US officials. A crane lifts a section of the helicopter as the operation to remove it got under way. This would explain why the Seals wasted critically precious time to blew up the mysterious helicopter and why many experts had problems identifying its remains. 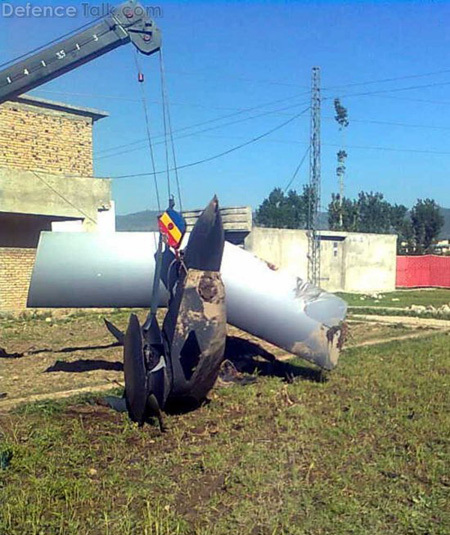 It's unclear what Pakistan could have made of the downed chopper, but growing ties between Pakistani and Chinese armed forces could have made the destruction of such new machine a must. China and Pakistan, over the past two decades, have developed a multi role combat aircraft called JF-17 and an advanced trainer, the JL-8. Black Hawk Down was a scenario, insiders say, that together with first attempt to rescue the hostages held at the U.S. embassy in 1980 in Iran, that's been evoked constantly in the planning phases leading to the May 1 raid, as examples of potentially disastrous outcomes. The stricken helicopter was one of four which took part in the mission. The others got away safely and there were no US military fatalities as a result of the raid by American special forces. 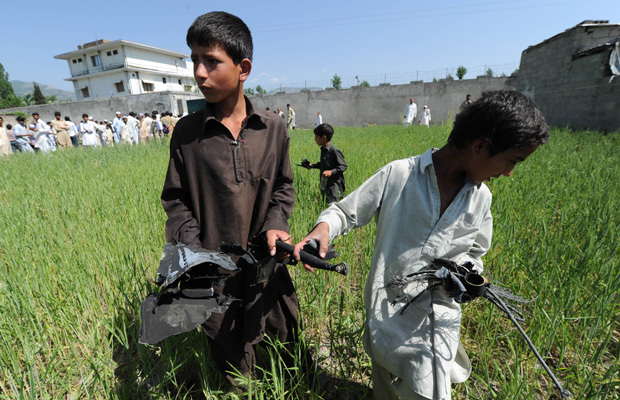 Pakistani boys collect debris outside bin Laden's hideout in the affluent suburbs of Abbottabad, a garrison town 60 miles north of the capital Islamabad. 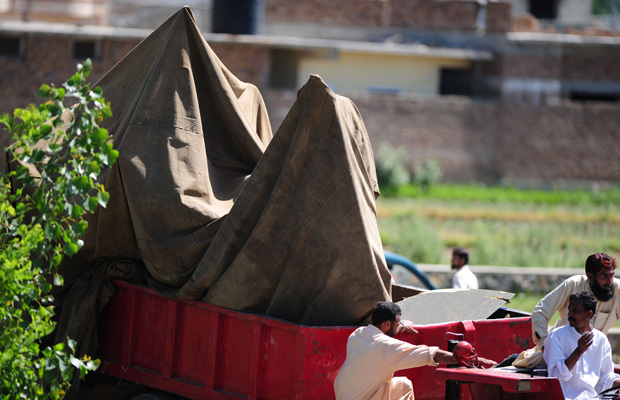 Soldiers in Pakistan take away parts of the crashed helicopter as the bullet-riddled house that hid bin Laden from the world was placed under police control.